[image: line drawing of a girl in figure-hugging dress with short skirt, large blonde hair-do rolled up at each side in 40's fashion, large eyes and lips. Image is signed VAL] DISCOVERY OF THE YEAR I am happy to present in this issue several examples of the marvelous art work of Bill Valentine. Bill has been reading Science Fiction for several years but has never been aware of Fandom, a Monday nite visit at my place for a discussion on some cartoons really led into a discovery. After sketching out a cartoon or two he reached for a large piece of drawing paper and started to work on a large drawing that gradually evolved into a Cartierlike creature. Since then he has done several more drawings for me and has stated that he is more than glad to continue to do so. So o o o You shall see more of his work in fanzines. Above is an example of his cartoon work while the cover is a bit of cartoon and fantasy drawing combined. He was busy one evening drawing the head of one of his unusual beasts when I noticed a copy of the California Mercury on my desk with the article about Lou Goldstone studying Black Magic, so I suggested t the idea which led to the Cover of this issue. WATCH FOR MORE OF HIS WORK IN THE NEAR FUTURE IN SEVERAL L A PUBS.... 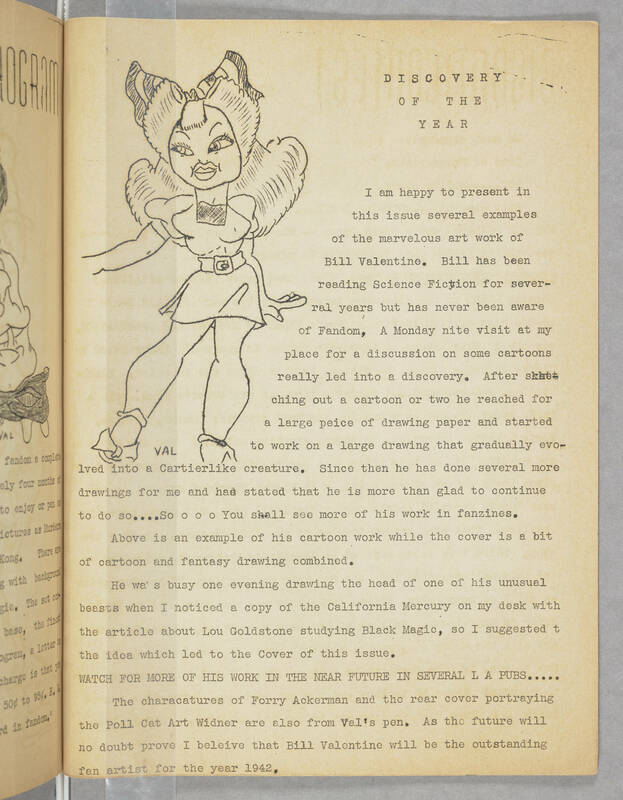 The characatures of Forry Ackerman and the rear cover portraying the Poll Cat Art Widner are also from Val's pen. As the future will no doubt prove I beleive that Bill Valentine will be the outstanding fan artist for the year 1942.